If you ever considered to take loans on your Graff diamonds & jewellery, then you are the proud owner of a fine piece of jewellery. The brand’s diamond jewellery combines a unique modern eye with traditional craftsmanship to create truly exceptional pieces. Buyers trust Graff because their diamonds are never sourced from mines which cause human suffering. The Graff jewellery house and its magnificent collections of jewellery are famous throughout the world, and this makes pawning your Graff diamonds or jewellery a very attractive alternative to selling your beloved pieces. If you already own one of Graff’s dazzling diamonds, rings, necklaces, bracelets, pendants or elegant earrings, you will appreciate the extraordinary and delicate beauty and style of Graff. Whenever a client calls and tells us, “I want to pawn my Graff diamonds,” we are confident that we can help with an expert valuation. That is why our loyal individual customers and dealers return to us when looking for loans on Graff diamonds and jewellery with our award winning pawn shop in Mayfair, London. And, it is why many of them go on to recommend our discreet and knowledgeable pawnbroking service to associates, friends and family. Laurence Graff himself said, “I was born to be amongst diamonds.” Contemporary Graff earrings and necklaces come in an abundance of cuts and designs; white diamonds, yellow diamonds, rose diamonds. Countless flawless and elegant gemstones decorating the most sensational jewellery. Graff’s yellow diamonds are said to be some of the oldest in the world, over 3.2 billion years in the making. But Graff is always looking to the future too, keeping the customers’ needs in mind, mixing tradition with high-tech to produce heirlooms of the future. How do you value my Graff diamonds and jewellery? We know clients feel good when wearing Graff, and that it is not always an easy decision to pawn this maker’s jewellery. We work hard to make sure the whole process is as quick and simple as it can be. Make an appointment with one of our professional team of experts and we will assess your jewels for provenance, clarity and cut in a personal and respectful way. After that, we release your loan quickly. We are the luxury London pawnbroker of choice with expert local knowledge of this jewellery house. Experience tells us that a pair of Graff yellow and gold diamond drop earrings could be worth over one million pounds. A large diamond pendant might retail for anything upwards of £1.5 million. In 2010, a 24.78-carat Graff pink diamond sold at Sotheby’s Geneva for $46.2 million (or roughly £40.3 million). Our in-depth knowledge means we are already well ahead of the game when setting the value of a loan on your Graff diamonds and jewellery. If you want to know what your precious stone, jewellery or collection might be worth, why not approach us for a free, no-obligation quotation today? We all need a little help at times. “Pawn my Graff diamonds and jewellery” can be just another way of asking, “please help me with my tuition fees,” or “Help! I need a temporary loan to buy a new car.” “King of Diamonds” Laurence Graff started off as a humble Hatton Garden apprentice. He went on to create one of London’s most famous diamond and jewellery houses. He now owns over 50 stores, a large share of diamond mine, and a personal fortune estimated by those in the know at nearly £4 billion. 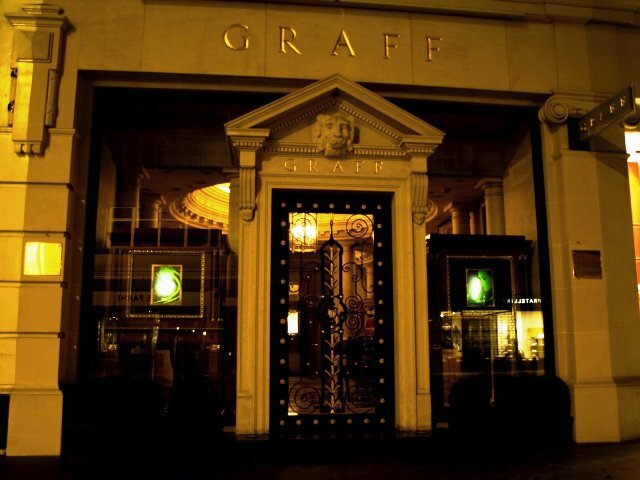 His central London flagship boutique acts as a sensational showcase for the Graff contemporary collections. It includes a display of flawless diamonds cut from the renowned 1,109 carat Lesedi La Rona rough stone. No wonder pieces produced by this iconic, luxury jewellery house are so highly valued. Get in touch today to arrange an appointment to visit our pawn shop in London’s New Bond Street. We treat every enquiry with sensitivity. For more information on services provided by New Bond Street Pawnbrokers please watch our video here and read about the loan process here.